Dedicated in 1876, Forest Park's 1,371 acres — which make it roughly 500 acres larger than New York City's Central Park — are home to 30,000 trees and five of the region's major institutions: the Missouri History Museum, the Muny (the nation's largest amphitheater dedicated to musical theater), the Saint Louis Art Museum, the Saint Louis Science Center, and the Saint Louis Zoo. Forest Park is bordered by Lindell Boulevard to the north, Kingshighway Boulevard to the east, Oakland Avenue to the south, and Skinker Boulevard to the west. Boating is one of the many physical activities Forest Park has to offer its visitors; others include tennis and golf, and ice skating in the winter. Photo courtesy Forest Park Forever. Superlatives and accolades for Forest Park abound. Some patrons consider it on par with the Smithsonian, while others speak of the park as the "heart and crown jewel of St. Louis" or cite it as the reason they chose to move to St. Louis. The park attracts more visitors annually than the Grand Canyon and Yosemite combined. It played host to the World's Fair and parts of the first Summer Olympics to be held in the United States in 1904. Among its amenities and attractions are lakes, museums, monuments, playing fields, bike and pedestrian paths, golf courses, sculptures and fountains, skyline vistas, and a world-class zoo. The park drew international attention at the turn of the 20th century when it was selected to host the Louisiana Purchase Exposition, more commonly known as the 1904 World's Fair. Renowned landscape architect George Kessler was tapped to redesign the park for the event, and he made several dramatic changes including the transformation of wetlands from five connected lakes. Permanent structures still remaining from the fair are the Flight Cage, Emerson Grand Basin, and the Saint Louis Art Museum. If the early 20th century was the park's zenith, the nadir came 60 to 70 years later, after years of budget shortfalls and underfunding created a backlog of deferred maintenance and crumbling park infrastructure. 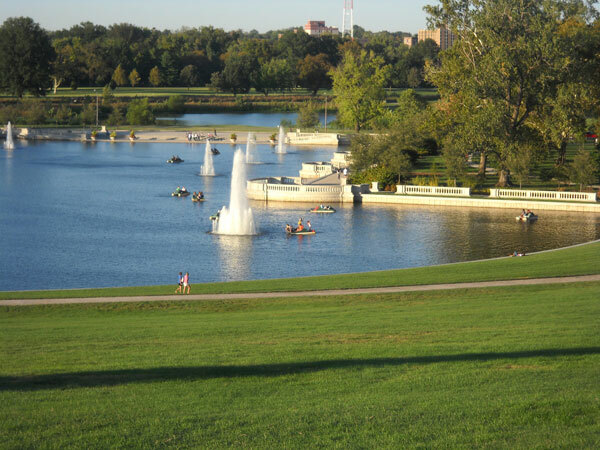 But in 1993, the City of St. Louis and Forest Park Forever — a nonprofit founded in 1986 to protect, restore, and care for the park — initiated a comprehensive master planning process to restore it to its former glory. Following the plan's adoption in 1995, a public and private partnership was established to implement the plan, which has involved raising $100 million for extensive building, landscape, habitat, and roadway capital improvements. With several recreational facilities — including tennis courts, golf courses, boat rentals, skating rinks, handball courts, and fields for softball, baseball, soccer, cricket, rugby, and archery — there is something for each of the 13 million local residents, special event attendees, and tourists who enjoy Forest Park every year. 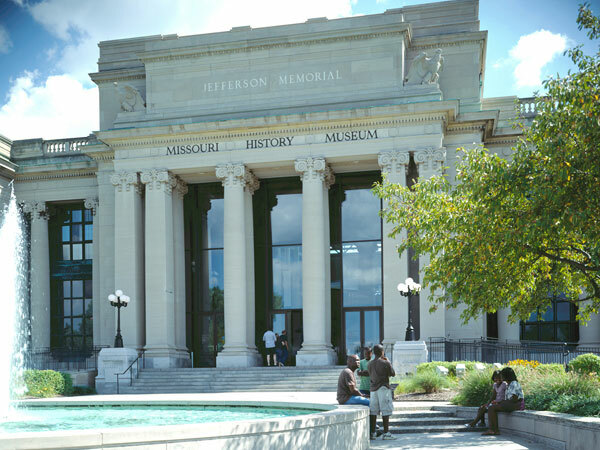 The Missouri History Museum, one of the region's most celebrated institutions, is surrounded by Forest Park's 1,371 acres of land. Photo courtesy Missouri History Museum. 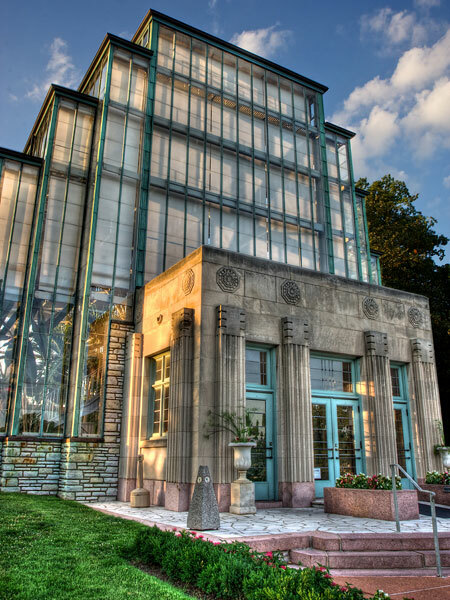 The Jewel Box in Forest Park is an art deco public horticultural facility listed on the National Register of Historic Places. Photo courtesy Randy Allen.